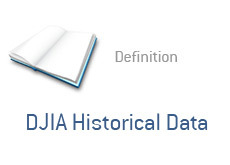 DJIA Historical Data - What Does It Mean? Where is the best place to find historical data for the DJIA (Dow Jones Industrial Average)? Is there some kind of a free resource for this online? I have create a couple of pages on this site that I believe that you might find useful. First off - the Dow Jones Industrial Average Historical Data page. This page is useful if you need a general overview of the history of the Dow Jones Industrial Average. If you need more specific data, then I would recommend out checking out this page. This page will allow you to look up intraday details for the DJIA all the way back until 1928. If you need to know where the DJIA closed on a certain day without too much hassle, then this page is for you. In addition, you will also receive NASDAQ and S&P 500 data from the same day.